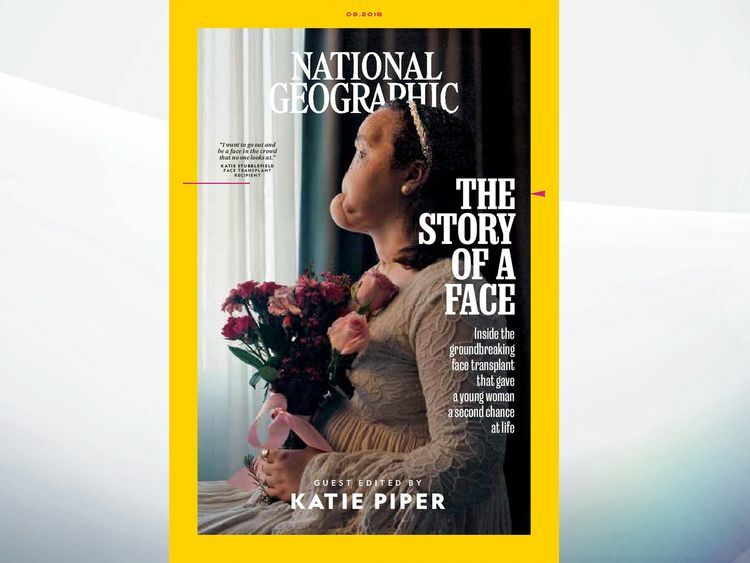 A 21-year-old woman who tried to take her own life by shooting herself in the face has become the youngest person in the United States to receive a face transplant. Katie Stubblefield underwent 31 hours in surgery after a three-year wait for a donor following her attempted suicide in her elder brother's bathroom in Mississippi. Her story has been told in a new National Geographic documentary and its Story of a Face magazine cover story following the historic procedure last year.Ms Stubblefield does not remember the day she tried to kill herself in March 2014 or much of the months which followed.She was transferred from a local hospital to the Cleveland Clinic, Ohio, as doctors desperately tried to save her life.They declared her stable at the start of 2016.Just over a year later, she received her face transplant, which restored her face structure and her ability to chew, swallow and breathe on her own for the first time since the incident. "I get a second chance at life now," Ms Stubblefield told National Geographic after becoming just the 40th person in the world to undergo the procedure.Speaking to the magazine, relatives said Ms Stubblefield had been a fun girl growing up in Lakeland, Florida, before going through a tough time, putting pressure on herself to excel in sports and at school.At the age of about 16, she moved with her family to Kentucky and then to Oxford, Mississippi, a year later.She soon fell in love with a fellow pupil at her new school who stood by her as she suffered severe health problems. In her senior year, she had her appendix and her gallbladder taken out as she continued to battle with digestive issues.Meanwhile, her parents, who both worked as teachers at her school, were made redundant.And according to the magazine, she saw texts on her boyfriend's phone from another girl leading to a breakdown of their relationship.Distressed, Ms Stubblefield, aged 18 at the time, went to her brother's home and took his hunting rifle and shot herself. She was taken to hospital and endured two years of operations, undergoing several procedures to repair her bone structure, including her nose, nasal passage and her jaw before receiving her new face from donor Adrea Schneider, 31, who died after a drug overdose.One of the surgeons behind the transplant, Dr Brian Gastman, said: "Her whole story made our team come together much faster, and we sort of ran toward her to take care of her. "We would do that for anybody, but many of us are parents ourselves and we saw what her own parents were going through. "Speaking of Ms Stubblefield's family, photographer Maggie Steber, who documented their journey, said: "They are warriors. "They're like eagles who are protecting a young bird. And now Katie has a mission in her life. She can try to save other young lives. ":: Anyone feeling emotionally distressed or suicidal can call Samaritans for help on 116 123 or email jo@samaritans.org in the UK.